If you have an Execu/Tech interface to your PBX system or DuVoice, housekeeping status probably can be updated from the guest rooms by dialing a code on the guest phones. See Phone, Movie, POS, etc. Rooms become dirty automatically when a guest checks out, and when Reorganize Files is run. Rooms also become dirty when guests are moved from one room to another; the room the guest was moved out of becomes dirty. To change the housekeeping status manually, click the Housekeeping icon or go to Front Desk > Front Desk Operations > Housekeeping. On this screen you can change only the items in the status column. Your options are C for clean, D for dirty, N for needs inspection, and O for out of order. The fastest way to go through the screen is to enter the status such as C and use your keyboard down-arrow and continue. 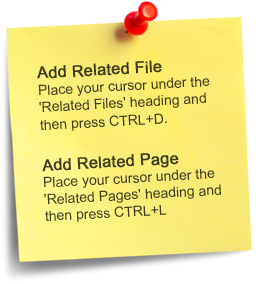 Press Esc on your keyboard or click Exit on the screen to save and exit. 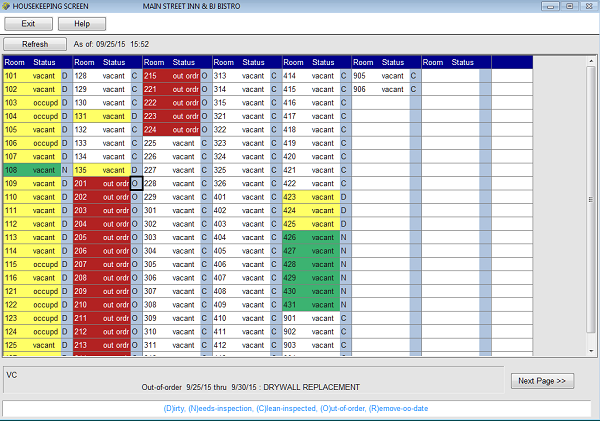 To set a room to out of order, type O in the status field and press Enter. 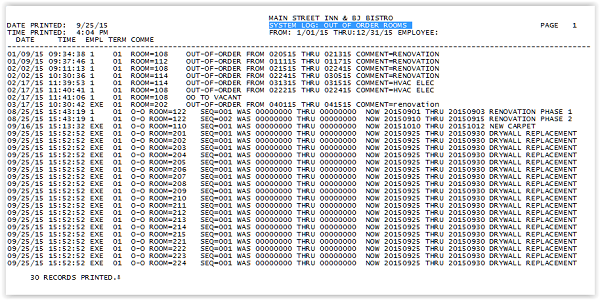 To print the housekeeping report, go to Front Desk > Print Housekeeping Report. Some hotels also print the Room Inventory Report without financial information (rate, payment type, and balance) and present this to housekeeping. You can tell at a glance if a room is clean (white), dirty (yellow), needs inspection (green), or is out of order (red). 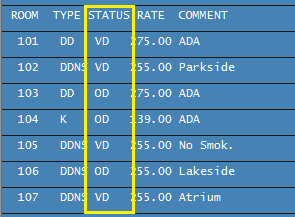 The blue column is where you change the status to D, C, N, or O. To set a room to OUT OF ORDER, enter O in the blue column next to the room number. You cannot set an occupied or reserved room out of order. You must check out the guest or reassign the room number. 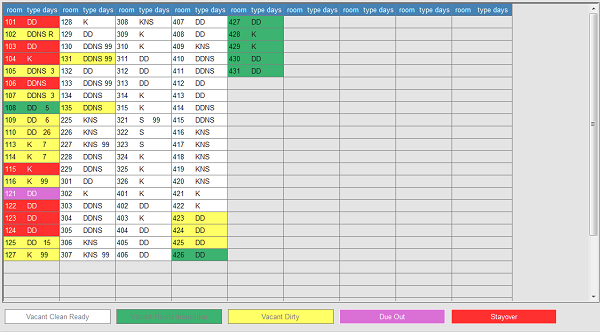 When you type O and press Enter the OUT OF ORDER grid will open, allowing you to list the reason the room is out of order or other comment, the beginning date, and the ending date. After doing the above, you can click the "Multiple rooms" button to set sequential rooms out of order. You will be prompted for a beginning room number and an ending room number. All of these rooms will have the same comment, same beginning date, and same ending date. To print the Housekeeping report, go to Front Desk > Print Housekeeping Report. 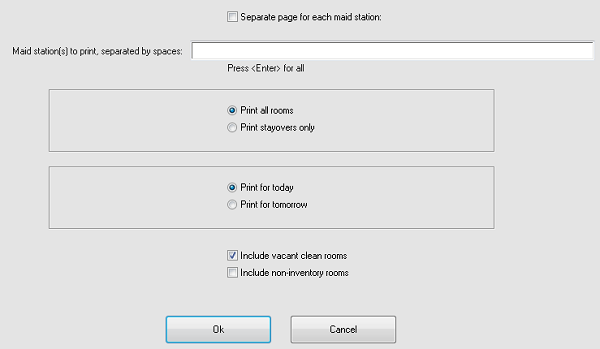 If maid stations have been setup (see Rooms) you may print by housekeeping maid station. Most hotels do not set up separate maid stations unless they are fixed, such as by floor or building. Select other options as appropriate for your report. You can elect to include vacant clean rooms or not, and you can elect to include non-inventory rooms or not. Here is a sample Housekeeping Report. 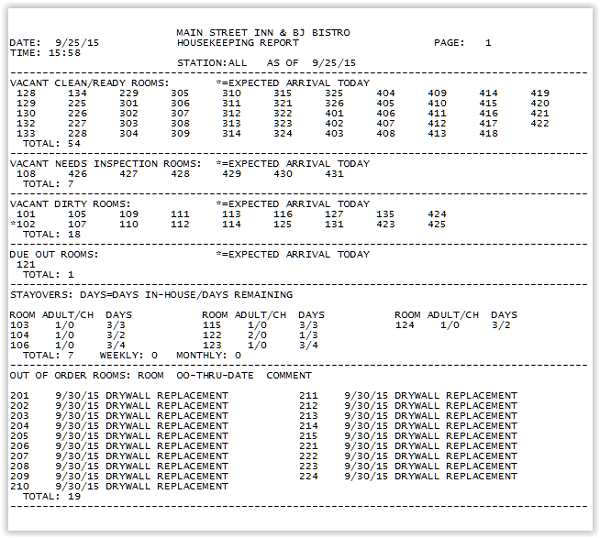 You may also print a Room Inventory Report. You can hide financial information (rate, payment type, and balance) if you do not wish housekeeping to view this information. 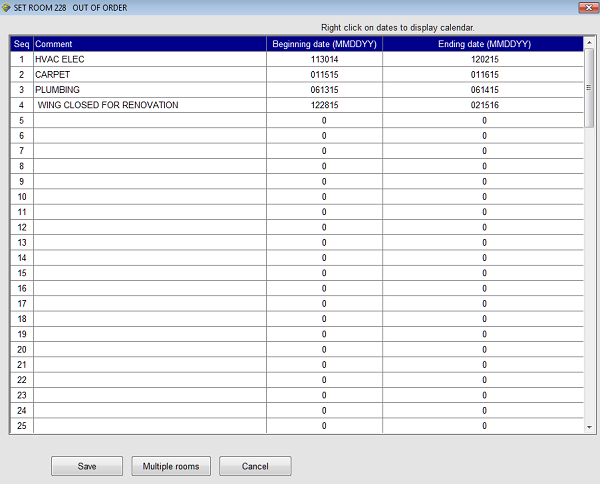 Here is a sample Room Inventory Report for Stayovers and expected arrivals. Here is what the Room Rack looks like. 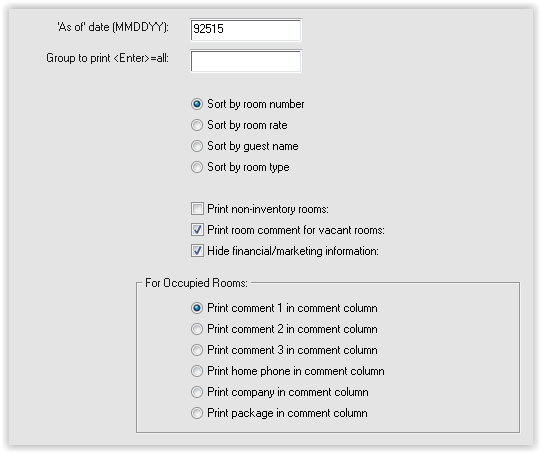 The Room Rack is the quickest way to assign rooms when checking in guests and is the screen that you see when you look up rooms during the check-in process. You can tell at a quick glance which rooms are clean. The Tape Chart shows out of order rooms in RED. The status is in the blue area at the left. In the Manager/Setup menu you can print an Activity Log for out of order rooms. You can print past, present, and future rooms, based on the date range you enter. If you have Enhanced Housekeeping enabled in your Parameter Record and have Housekeeping Codes, the housekeeping codes will print on the Housekeeping Report. Examples of Housekeeping codes are D for daily, O for check-out, T for Tuesday, and so on. These are user defined one-character codes.